The main advantage of making bhatura at home is we can use some healthy options in this fast food recipe.The bhatura which are served on roadside eateries or hotel is made up of maida and lots of oil or vegetable fat (dalda /sunflower) is added to make its dough .At home you can easily make this bhatura with whole wheat flour (gheu ka atta ) and no maida in it,in place of oil and vegetable fat you can add boiled smashed potatoes .this bhatura recipe is very easy & you can get the better taste and the same puffed ball of healthy bhatura which turns by its own when you fry it . Bhatura comes out really well from this recipe and it will not become chewy even when its cold. Potatoes ,sooji (semolina/rava) and curd makes this bhatura crispy as well as spongy. 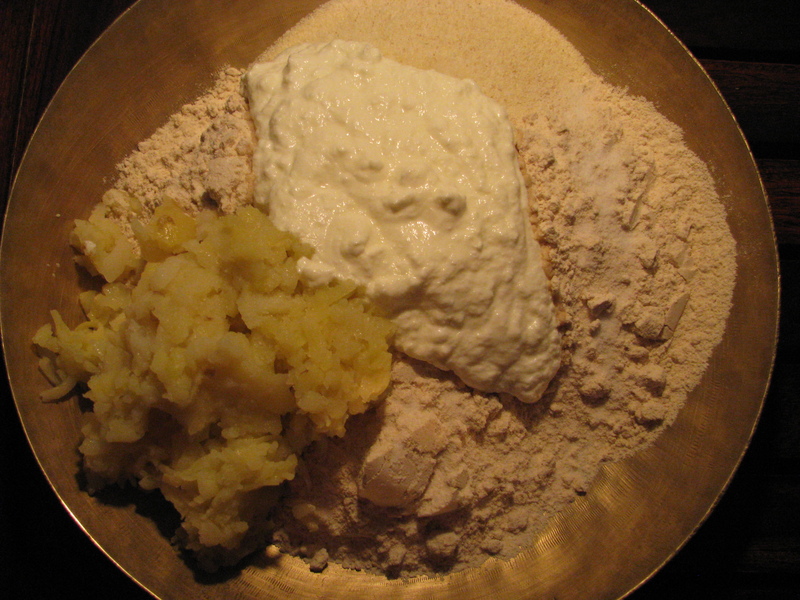 Give time for the dough to get fermented, when you make bhatura from curd and whole wheat flour( gheu ka atta) . If you want to make insant bhatura you can check my Instant bhatura recipe where I used soda water (club soda / carbonated water ) to make bhatura dough ,this recipe is very quick and u can fry the bhatooras immediately after you make dough. So here is my step by step bhatura recipe from curd and gheu ka atta (whole wheat flour). Keep the oil /ghee to heat and prepare one plate by lining it with tissue papers so that we can keep the fried bhaturas in it and the extra oil will be soaked by tissue papers..
Then Add the rolled out bhatura gently in hot oil ,to avoid splashing of hot oil .after 5 -7 second with the slotted spoon press it gently in the centre this will make bhatura puff like a ball ,turn the bhatura and fry it on both side to make it little brown..take the bhatura out in a plate we have already prepared with tissue paper lining to absorb extra oil …. Don’t add plain water to make a dough ,use curd to make a soft smooth Bhatura dough..
For frying bhatura oil should be hot and bhatura should be fried on high flame otherwise it will soak to much oil. If you want to cut more calories from bhatura roll bhatura dough into small chapattis and roast it on pan or skillet/ tava . We can also bake bhaturas, but I haven’t tried it yet if you have any recipe for whole wheat flour baked bhatura you can share it with me. My name is Uma and I discovered your blog yesterday and all the recipes seem so healthy and amazing. 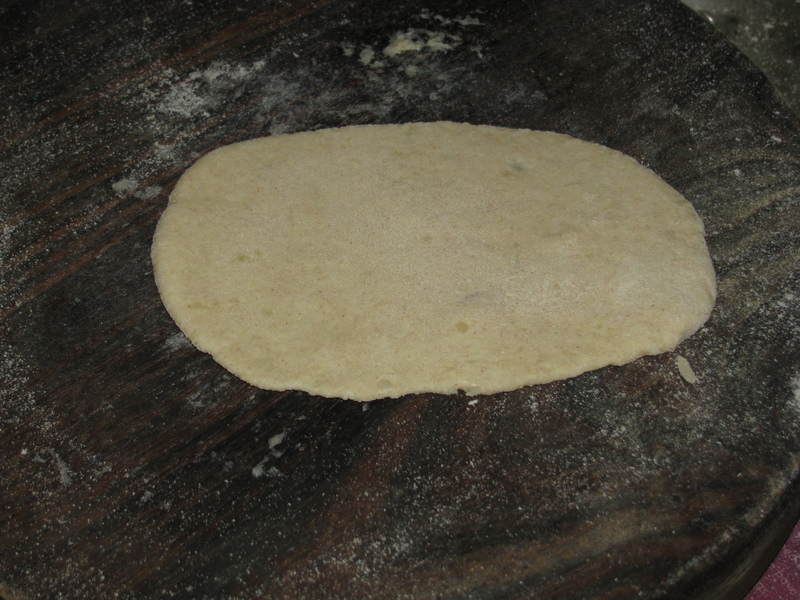 I have a quick question; Is there a way to roll the dough for Bhatura without using flour? Flour destroys the oil in which we are frying and also causes a lot more smoke residue. You can apply little oil to bhatura dough ball , press it with ur fingers and then roll it to give it a proper shape .Try it out and let me know if it works. I have a quick question… tht the quantity of flour is more than the quantity of curd.. nd it dose not get kneaded without water!! What if we add water while making dough!! With curd i have also added boiled smashed potatoes.Water content of Boiled potatoes also gives nice binding to dough. if you still have issue while making the dough you can add extra curd or water to make it smooth. I found your blog during searching healthy fried recipe for my daughter school lunch… thanks for sharing it.. I have question that what will happen if I make bhatura dough and dont give it time to ferment… ? Fermentation makes Bhatura more fluffy , you can make Instant Bhatura if you dont want to ferment it. Check out http://healthyvegrecipes.com/recipe-of-bhatura-with-club-soda-water/ or you can also try Mini Cheese Bhatura if you are planning to give it in school lunch box check out http://healthyvegrecipes.com/whole-wheat-flour-chatpate-cheese-bhature/ . This cheese Bhatura comes out really well even if it is not fermented. Hi, I just wanted to know that what if prepared dough has been kept for more than 6-7 hours like say for example it is kept for 11-12 hours, will it spoil the taste of bhature?